At the reconstructed Sun Watch Indian Village/Archaeological Park in Dayton, Ohio, we learned about the health and living conditions of the Fort Ancient Indians who had occupied this area for 20 years in the early 1200s. Being an American Indian along the Great Miami River before the Europeans arrival did not end up sounding much like living in paradise. When excavations were begun in 1971, archeologists did not have the equipment to avoid digging up graves, but now with modern devices great care can be taken not to disturb grave sites.. We watched a worker with an electronic device mark the areas that had objects lying underneath with the density of bones, and these areas will not be excavated. The American Indian Advisory Council interred the remains of those bones that had been dug up earlier, but not before some interesting facts about the early Indians’ general health were discovered. An ongoing dig is unearthing the story of Sun Watch. Half of the children died before the age of six, 25 percent of the adults had spinal diseases and even in young people, teeth were in poor condition. Few who survived childhood lived beyond the age of 45, with the average life expectancy for men being 36 years and for women 28 years. By careful examination of the ground, archaeological teams have been able to reconstruct the outer defensive wooden wall, 18 huts housing from six to 16 people each, a large communal building and a smaller communal building for men. In the middle of the central plaza was a 40-foot high cedar pole and four companion posts, which indicate that the inhabitants had used astronomical alignments for such rituals as when to start planting and harvesting. The gravesites were arranged between the huts and the center poles with rank determining placement. A small area near the men’s meeting room held the bodies of those with the most power in the community, the level of status being shown by the sea shells and other objects of worth buried with them. Further from the huts and closer to the pole were the bones of people of medium status, and just in front of the huts were the bones of those considered to be of the lowest status. 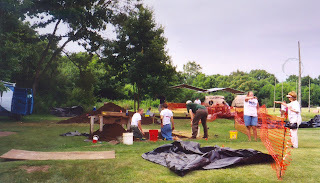 On the day we visited, the archeologists conducting the ongoing excavations were being assisted by ten undergraduate students from a class at Ohio State University, ten interns from other schools and a number of volunteers. The dirt is carefully sifted through a screen so that the smallest piece of crockery or bone is not overlooked. The best place to find objects of value is in the trash pits. These originally held 300 to 500 pounds of corn, but the food had deteriorated. The people then used them as landfills. It is from these pits that much of the lifestyle in the village has been reconstructed. One of the findings is that these people had a wide-ranging trade system that brought in products from as far away as the ocean. Student April Shoemaker showed us her team’s discoveries: an owl carved on bone, a crockery shard, several pieces we didn’t recognize and a small, stone axe head. Another student demonstrated where to stand near the cedar pole to make judgments about the change of seasons. 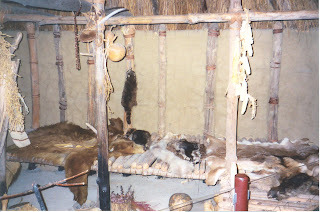 The reconstruction of the interior of a native dwelling. A movie in the interpretive center explained the history of the village people and the reason they had chosen this site. The river provided water and fish, and the soil originally was rich and very suitable for growing corn—their main food—beans, squash, gourds, sunflowers, and tobacco. A number of factors contributed to the demise of this village, among them the declining fertility of the soil and the depletion of trees and game. The last of the Fort Ancient Indians were driven from the Great Lakes and Ohio Valley regions when the Europeans came. Old World diseases killed off many. The Iroquois, equipped with rifles from the Europeans, began the Beaver Wars and drove off the rest by 1690. In the interpretive center, we explored the interior of some of the reconstructed houses, examined the villagers’ tools and saw mannequins engaging in day-to-day activities. In the interpretive center mannequins were displayed engaging in day to day activities. Besides the involvement of college students, we noticed that children of varying ages were being taken on tours of the interpretive center and the village. On our travels around the United States, we are finding an increasing number of sites that pay respect to American Indians by building interpretive centers and reconstructing the lifestyle. They are usually well done with excellent displays and knowledgeable guides.